It has been awhile since I've done a Runner's Spotlight and I couldn't think of a better person to get the ball rolling again. I met Rachel last year when we shared a van for 36 hours during the Hood to Coast Relay. I vividly remember Rachel mentioning to me her desire to run the Mercedes Marathon as her first. I told her if she signed up, I would as well. Flash forward to the present and in just a few days, I'll be heading to Birmingham to run the Mercedes Marathon alongside Rachel. Well...most it. I'm still easing back into running from my recent injury so I'm planning to run about 16 miles with her. I think the most satisfying thing about being a marathoner is witnessing someone else take on their first. 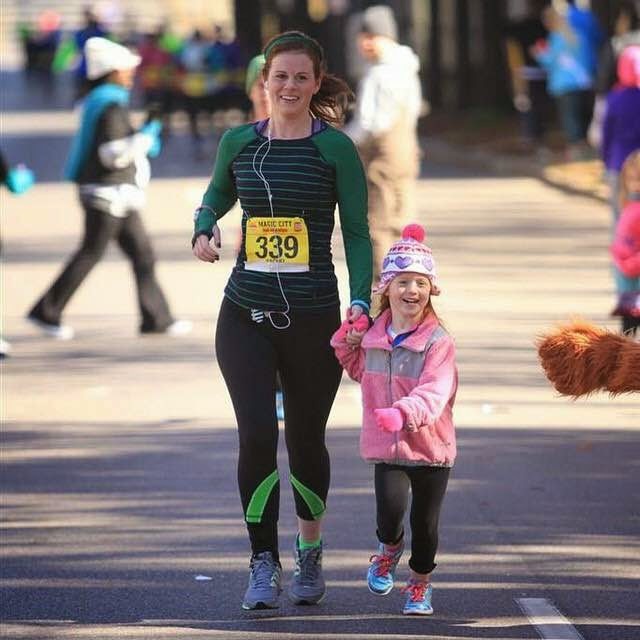 Your first marathon is something you never forget. When I think back to mine, it brings nothing but warm memories. So, my excitement about Rachel's first is that she will soon get to experience all those amazing emotions of running a marathon. She has trained very hard for this and I know she is going to have a great race! Rachel was kind enough to take some time out of her busy mommy life (she has two little ones) to answer a few of my questions. Runners, meet Rachel! Rachel McPhillips: I started running in the Fall of 2009 so I could mark "Run a 5K" off my bucket list. A month later, I signed up for my first half. It took a couple of those before I fell in love with running. Once I realized that running is about competing with yourself and not trying to prove anything to anyone else, is when it stopped being a chore and became a priority. Do you remember what your first road race was? RM: My first road race was the Jingle Bell 5K in December 2009. It was rainy, and cold and I wasn't sure if I would actually finish. RM: I love to soak up the essence of a race. I think every finish line you cross changes who you are from when you crossed the start line. I remember vivid details about all of my races. There are 3 races that stick out in my mind-- one is Nike Women's DC, where I ran it side by side with one of my best friends, Molly. The Tiffany necklace at the end wasn't so bad either. 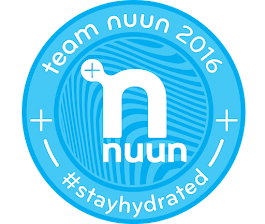 The second race is Hood to Coast with Nuun Hydration. While that was definitely more of an experience vs the actual race, I met some of the most amazing people on that trip that I now get to call friends, plus run for a company that I truly believe in and love. The third race that sticks out in my mind is the Talladega Half. It was my goal race and I basically had a panic attack in the beginning of it and fell off pace. I wanted to quit in the middle of it, but kept pushing on and ended up running the last half with a friend and we had an absolute blast! Do you have a weirdest/funniest running moment? RM: All the weird moments are gross, so I won't share those with the Internet, but probably one of the funniest moments is when I tripped and fell during a race. I rolled down a hill (Not gracefully, at all, I might add) and actually had a lady turn around and come back for me saying "Are you okay?? I heard you fall!!" I was so embarrassed. Who is the biggest motivator in your life? RM: My biggest motivator in life are the two little redheads that call me Mom. They watch and listen to everything I say and do, so it helps me to try to stay positive and set a good example for them. I want them to understand the importance of taking time out for yourself, hard work, and self motivation. You’re running your first marathon soon. How has your training gone? What are your emotions leading into the big day? RM: My training has been different than most, in that it's been grief-stricken and extremely therapeutic. When I lost my mom in October, I wondered if trying to tackle the 26.2 was going to be too much, but I just took it one run at a time, and never looked ahead too far. I thought for a while that training for this would bring me some sort of closure and peace with her death, but I realized a few weeks ago that it isn't going to do that. I know that she was proud of me for doing this, and also thought I was crazy. I had some of the most fun on my long runs with my friend Tanya, and if it wasn't for her, I don't know that I would have made it on some of those runs. While my heart is heavy with the loss of my mom, I am excited and feel ready to tackle this race. It doesn't hurt that I have some amazing Nuun Hood to Coast teammates coming to help me celebrate! If you could only give one piece of advice to someone just getting into running, what would it be? RM: Don't give up! You will feel awkward and out of place in the beginning, but don't let that stop you! If people offer to run with you, take them up on it. Other runners are the only people who will get your drive for this, but don't get so caught up in what everyone else is doing that you forget why you started. What’s next after Mercedes? 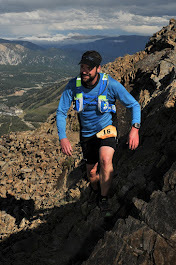 Signed up for any other races this spring? RM: I haven't signed up for any races, but I think I want to concentrate on a 5K or 10K PR for the Spring. I also want to take on more trail runs. Rachel is an ambassador for Nuun Hydration and FitFluential. Good luck Rachel! Wish I could be there at Mercedes with you guys but know you're going to rock it! Hey, that's my wife. Way to go Rachel. You are going to Rock it!!!!! Good luck Rachel. I'll be cheering you on from AZ! Wiggle, wiggle, wiggle!!! !